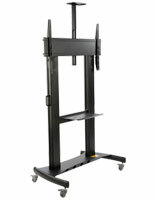 This silver 80" TV cart is ideal for heavy duty use in commercial environments. 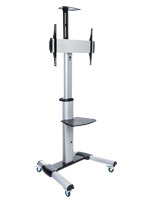 Each 73.25" tall portable monitor stand is made of durable aluminum, with four sturdy caster wheels that lock for stability during use. 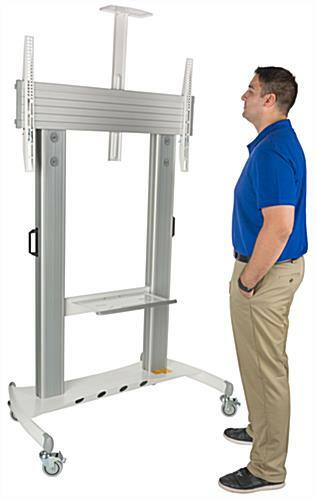 This 80" TV cart supports 60"-100" flat screen displays on a VESA-compatible stationary mounting bracket and will hold monitors weighing up to 300 lbs. 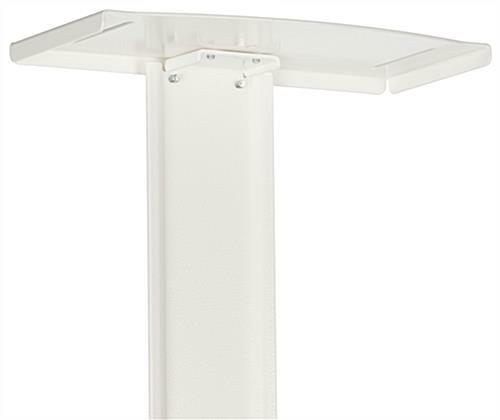 This stylish monitor stand's contemporary design features an adjustable height equipment shelf as well as a camera tray, making it ideal for presentations and training use as well as digital advertising display. 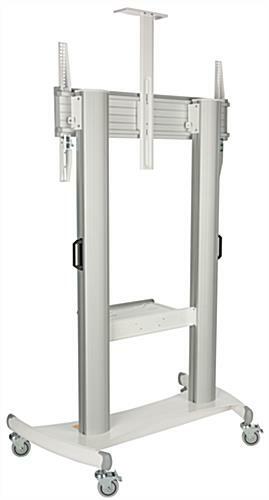 This commercial TV cart with locking wheels is designed to be easily moved between locations as needed, and each caster locks for stability when in use. 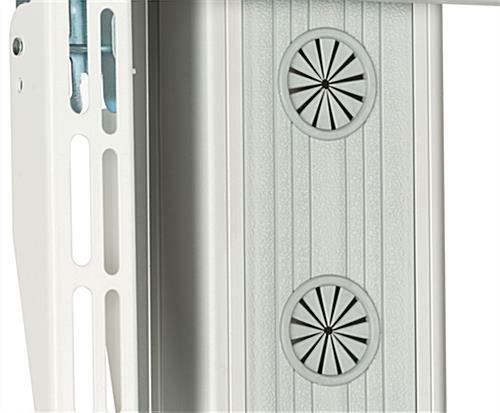 The neutral finish will complement any office, retail envionment, conference facility, or trade show booth decor. 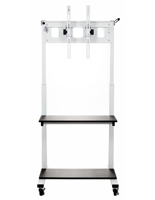 This portable TV cart with equipment shelf and camera tray is easy to assemble and can be taken apart and transported as needed. 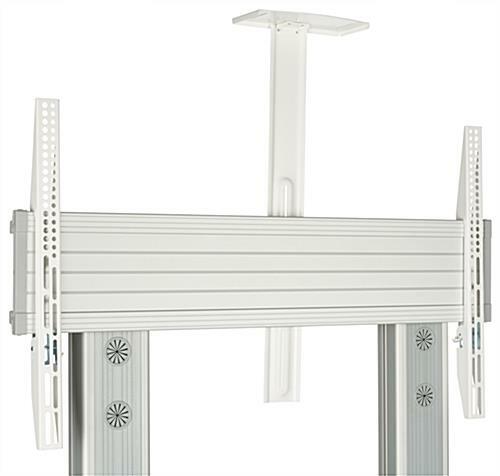 The stationary VESA bracket supports widescreen LCD monitors for sizes between 60" and 100" wide, including commercial 84" monitors. 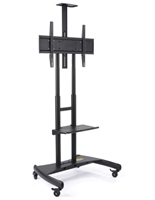 This rolling floor stand TV cart for flat screen LED televisions is an ideal accessory for classroom, office, training room, conference, or trade show use. This type of high visibility fixture is also a great way to showcase digital advertising or promotional presentations in high traffic areas. 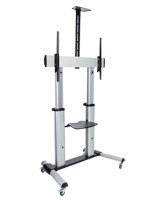 The aluminum alloy base is durable and designed to withstand heavy duty use supporting monitors weighing up to 300 lbs. 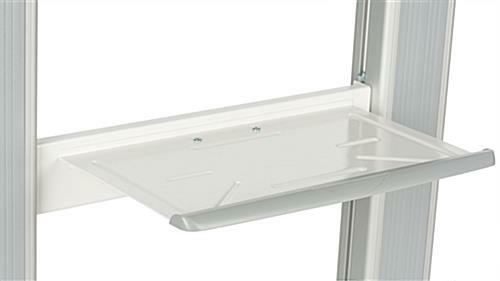 This display comes with a set of mounting screws compatible with most flat panels, although certain television brands may require special screws that are easily available at hardware stores. Please Note: When assembling this stand, keep the screws for the upright posts loose and tighten as the final step in the assembly. The assembly of this monitor stand was easier than expected. Everything fit together nicely, nothing needed to be "convinced" to go together. 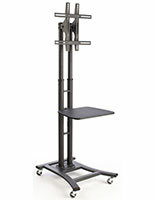 The stand is very sturdy and easily supports our 73" monitor. Not worried about it falling over or anything. Can't ask for a better vote of confidence than this, Steve! We're thrilled to hear you're satisfied with your TV mount and thank you for taking the time to leave us such a nice review! We bought this stand for a 70" TV. Very easy to put together. Very easy to attach the TV too. Love the brakes!! Definitely need those brakes with a heavy TV, right Mary :) Thanks so much for the great review. We're so happy to hear that you are satisfied with your purchase. 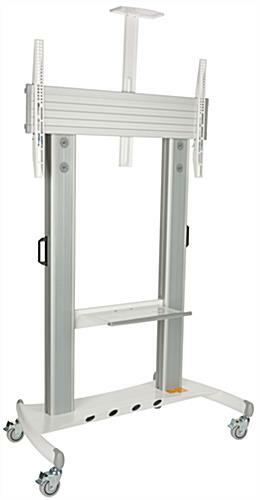 Easy to assemble, seems very sturdy and high quality (with the exception of cheap feeling pull handles.) Big wheels and light weight make it easy to roll. Additional shelf would be nice as sometimes one isn't enough. Thanks for the feedback, Jeremy! We appreciate it. We've used this cart in multiple locations. The wheels are big enough to get over broken sidewalk and crosswalk curbs. The cart has adjustable handles to help steer it. 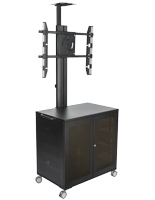 It fits a rack mounted to the base below the TV nicely if you need to use it in a classroom setting as we do. We've just bought 4 more and we're using them with 65" to 70" TVs. 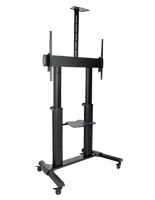 Again, we have purchased 4 of the TVSTN80 Monitor Stands. The product is fine, however, I called about replacement parts and they are not yet available. 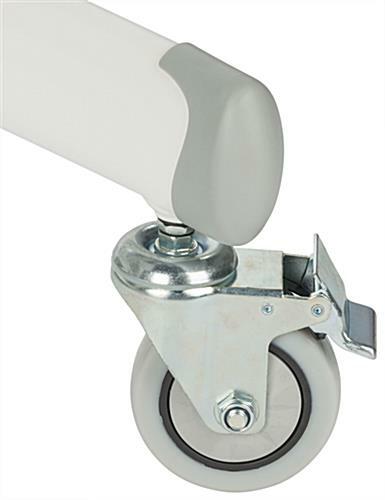 These units are sent to trade shows and the gray plastic end caps (NOT the casters) on the legs frequently break or come off. Spares should be available. We are very sorry that we do not currently offer spares. We may in the future but unfortunately currently do not. If you would like to discuss potential return of your item, our customer care representatives are here to help via phone, chat, or email.